Join 7,275+ moms nurturing faith + faithfulness at home. Looking for swim lessons for your kids? Make sure you double check your swim option has these 5 necessities! Recently my friends and I started talking about swim lessons. We all felt learning to swim is a critical skill for our kids to learn, but none of us knew where to begin when looking for quality instruction that didn’t break the bank. All through high school and college, I taught private swim lessons at a local country club, but I can’t pay the $50+ per half hour private clubs charge. On the other hand, I don’t want my 3 year old to be lumped into a group of 8-10 kids per instructor just because that’s all we can afford. After doing a little research, I discovered that you don’t have to compromise on quality swim instruction for your kids. In fact, I was recently invited by The Motherhood and Big Blue Swim School to bring my 3-year old daughter in for a free swim lesson and share about our time at their swim school. We had a fantastic experience! This post is sponsored by them, and I can’t wait to tell you about our experience and why you might love Big Blue Swim School, too! They really set the bar for us on swimming lessons. If you’re looking to enroll your kids in swim lessons, here are 5 things to look for in a swim school — and how Big Blue Swim School wins at each. While the high school swim team captain might be a great swimmer, she may not be a great teacher. So many pools and swim schools hire to fill a position rather than hiring to meet a need. When evaluating swim instruction for your kids, make sure the teachers are trained in swim instruction. They should receive formal swim training and follow a curriculum that will meet your kids’ needs while fueling growth at the same time. It’s also important the swim teachers enjoy kids and have the training needed to teach effectively. Good swimmers don’t automatically equal good instructors. —> At Big Blue Swim School, swim teachers receive over 100 hours of training, plus ongoing weekly education. Also, a general manager observes every lesson so that feedback can be given to both teachers and parents. The result? The kids get exactly the instruction they need and have fun doing it! We want our kids to learn to swim to increase their safety, and we want our kids to be safe while learning to swim. As you’re evaluating a swim school option for your kids, ask a few questions about the safety of the facility and classes you’re considering as well as the safety skills your child will be learning. Is your child learning to swim in a safe environment? How large are the classes and what is the student to teacher ratio? Do swim instructors undergo criminal background checks? Are swim instructors up-to-date on their CPR and First Aid trainings? Are children learning transferrable water safety and survival skills to use in other bodies of water? —> At Big Blue Swim School, all 3-5 year old classes are capped at 3 students to one teacher, and many times, the ratio is 2:1 or even 1:1! Also, Big Blue Swim School is the only swim-lesson provider that exclusively hires and trains full-time teachers. Among other benefits, having full-time teachers provides consistency for your child, better training of the teachers, and more of a family feel to the facility. Because Big Blue Swim School is not a franchise, they are able to provide a better experience for parents by investing in people. We love that. I am a firm believer that kids can’t learn when they’re cold. Pools are generally kept between 84 and 88 degrees, but in those temperatures, most kids are shivering — especially smaller children and those who aren’t yet as active in the pool — and have a hard time staying in the pool and learning new skills. —> My kids tend to always be cold in the water, so we were thrilled to find out that Big Blue Swim School keeps their pools at 90 – 91 degrees. I also really appreciated learning about their pools’ saline system and ultra-violet filtration which provide a state-of-the-art defense against waterborne illnesses and harsh chemicals. I’ll be the first to admit that I have pulled my kids out of different activities and lessons because the facilities and schedules made life difficult for families. Have you ever tried to keep a 2, 4, and 6 year old quiet and still in a 10 square foot room packed with 10 other families during your 8 year old’s 38 minute practice? Or maybe you lined up all of your kids lessons in such a way that you didn’t have to juggle as much driving, coordinating, or disruption to the normal schedule, only to have one of the kids move up a level and mess-up the whole schedule? We can manage, of course, but we sure appreciate when a facility makes scheduling, facilities, and amenities convenient for families. –> One of my favorite parts of Big Blue Swim School how easy it is to set lessons for your whole family!! Big Blue Swim School offers more lesson times than any other provider, and they use their own proprietary software platform that allows families to choose a lesson time that works for all their kids with one click. This means families don’t have to make multiple trips to the pool just because siblings were unable to find a time where they could both swim. The software also allows families to log into their account from any device and track their kid’s progress, move their lesson times, schedule FREE make-up lessons, add additional lessons, and update personal information in just a few easy clicks. Once all 4 of my kids were in the system, it took about 3 minutes to pull up class availability for all four of my kids to have a lesson at the same time. Scheduling is a breeze — a huge help for families! In addition to all of the variables above, affordability is key in signing your kids up for swim lessons. Is the facility you’re considering affordable? Do they offer make-up lessons if you miss a week? Are there discounts for multiple children or more than one lesson per week? Are there registration fees or any other fees in addition to the cost of the lesson? –> Big Blue Swim School offers competitive prices, discounts for multiple lessons, no registration fees, AND, if you miss a lesson, you’re not out that money. Big Blue Swim School offers free make-up lessons — a huge plus for this budget-conscious mom! Swim lessons provide multiple benefits for kids, but it’s important to find a swim school that works well for your family. These are some additional questions to ask when choosing a swim school for your kids. Are the changing facilities clean and safe? Also, how convenient are the changing facilities for a family with multiple kids? How easily can parents observe swim lessons? Are parents allowed on the pool deck? Do swim instructors get in the pool with the kids or coach from the side? Are children grouped according to age or ability level or a combination of both? How much downtime do kids have in the class? With larger class sizes, students will have less direct instruction and observation. Do they spend more time waiting than learning? Will my child have the same instructor from week to week? We LOVED our visit to Big Blue Swim School. From the moment we walked in, my kids were excited and engaged. I appreciated the huge, open waiting room with fantastic views of the pool and activities for the kids — and the wi-fi, too, of course! ;) Parents are invited to observe from the waiting area or join the kids on the pool deck. We opted to observe from the pool deck. My 3 year old daughter was a little nervous at first, but her teacher got her laughing right away and kept her laughing and learning throughout the whole lesson. I couldn’t believe how well she did, even swimming a few strokes unassisted!! She didn’t want the lesson to end, and every.day.since she’s asked if it’s time for her next swim lesson. We walked into Big Blue Swim School for one lesson for one child, and we walked out signed up for lessons for all four of our kids. We are so excited to be part of the Big Blue family! A Big Blue Swim Offer for YOU! It pays to sign up now! Big Blue is offering six swim lessons for $60 when you sign up for weekly lessons – a discount of more than 50% on standard prices. Want to get in the Word with your Kids? When you subscribe, you'll receive a surprisingly simple, no-prep, start-today plan to get in the Word with your kids and encouragement to resources to nurture your kids in faith & faithfulness! 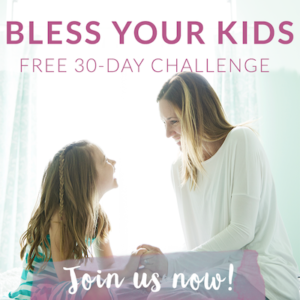 Join over 7,275+ moms who are leading their kids to Jesus and nurturing faith at home!